With their latest model, the Mercedes tuners of Brabus complement their collection of records. At least, they call their revised G-class the world's fastest off-roader. Indeed they have done a lot to achieve performance rates that makes it believable. In numbers: 700 hp and 1,320 Nm. Regardless of the fact that sales of 12-cylinder engine cars have dramatically declined in this recession, they use such a motor as a basis. But, the aggregated of the S 600 gets a full treatment before it find its way into the engine bay of the G-class. Amongst the measures: Displacement increase from 5.5 to 6.3litres, larger turbo charges, enhanced intercooling and an overworked crank mechanism. A specially designed exhaust systems has been mounted to the motor. Its opposite sides end in front of the rear wheels. Meaning there are two side pipes at right and at the left of the car. So there are no end tips at the rear that could hint to the power of the thing! This would probably increase astonishment of sports car drivers trying to follow. The vintage car-style car body suggests yesterday's acceleration capabilities while the tuned engines pushes the old-school off-roader in breathtaking 4.3 seconds to 100kph. Top speed isn't quite as impressive as the standard sprint time! 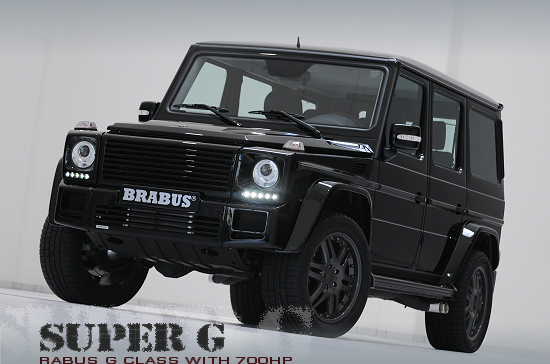 Not only it's limited to 240kph, Brabus say that 260kph would be the maximum without the limit. Of course, the adverse, not to say absolutely 'inaerodynamic', shape prevents the thing from being even faster – in addition to its high weight! Brabus have added a 379,000-Euro price tag to offering. This might not higher weight noticeably but could have a deterrent effect. Of course, the price includes more than just additional power. A refined suspension for better driving manners, wheel arch flares to make using wider rims possible, and a high-performance brake system enables decent deceleration. There's also a front apron which perfectly mirrors the design of the grille below it. On request, the Brabus guys cover almost anything with fine leather, equipe the fast G-class with several sorts of entertainment goodies, office equipment and/or some additional LED illumination, Brabus logos included! So much care for such an old model? Well, that's only possible when it's about a Mercedes-Benz!